PLEASE NOTE: Most of my Memory Keeping Q&A posts are being presented on my main blog. I decided to put this post here on the Projects blog as it feels more at home here with the images and the video. 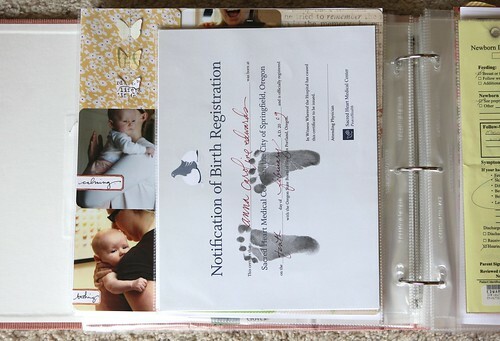 ANDI | I know Anna is 2 now but I was wondering if you ever did a baby book for her, you talked about it. I know that she will have her own set of books like Simon but I remember you saying that you didn’t like the “pre-made” ones that you find at the store. I didn’t buy one of those either and I was wondering what you scrapped and how you did it. 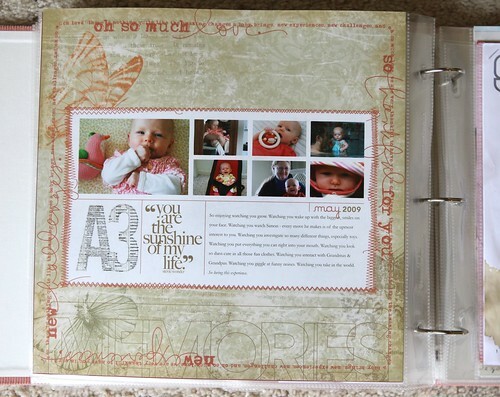 AE | I'm so glad you asked about this as it spurred me to pull out her album and see exactly what I had done with it. It's been awhile since I've looked through this album - I've added layouts here and there but have not actually taken the time to see what I have and what I don't have. Here's the original post from April 2009 where I talked about my approach to this album. I mention that there is no master plan and there really wasn't - which resulted in what I have here - a collection of stories from her first year of life along with some other bits and pieces I saved along the way. 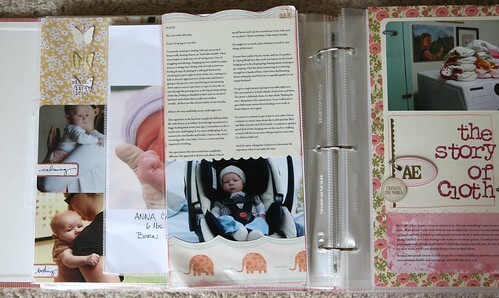 I know if I go back to my 2009 and 2010 photo folders I'll find more stories I'd like to tell about Anna's first year. I'm seriously thankful that I have stories told. I'm not upset that I don't have every little thing documented. Many of the most detailed stories came from posts I did on my blog that document all the little things that were happening with her from month to month (not on a specific schedule necessarily, but enough to get a good picture of specific points during her first year). I like that I kept the well-baby visit handouts that include her weight and height. The pages are going to be re-organized in chronological order. For this post and video I just took pictures and did the walk-through "as-is" so you could see it just how it is off the shelf without being fixed up. I actually kinda like that I haven't looked at it in awhile. Looking at it again over the last couple of days I have a new sense of excitement about getting some more pages done specifically for this book to round out the project. 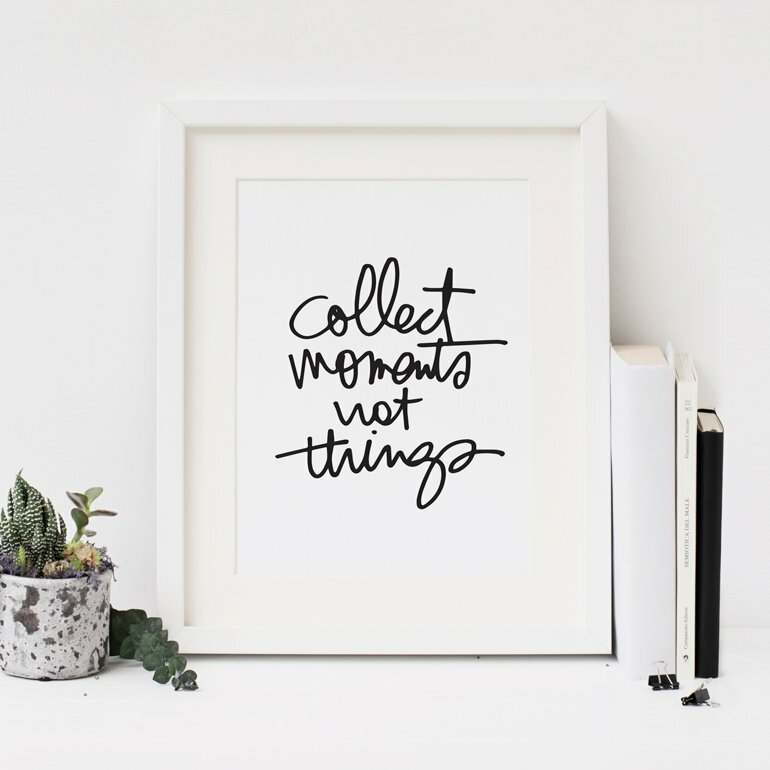 It's a nice reminder that things can sit for awhile and all is not lost (and part of the reason it's not totally lost is that I've got content to pull from in the form of stories I've posted on my blog). A layout (or more than one) about our childcare and the relationship both my kids have with the people who make a big difference in our lives. Maybe a month-at-a-glance. 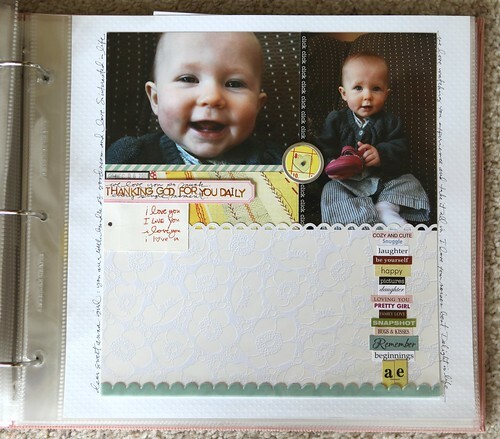 Using a multi-photo layered template (like this one or this one or this one) I could easily go back into my monthly photo archives and grab photos from each month of her first year. I'll share these as I do them. 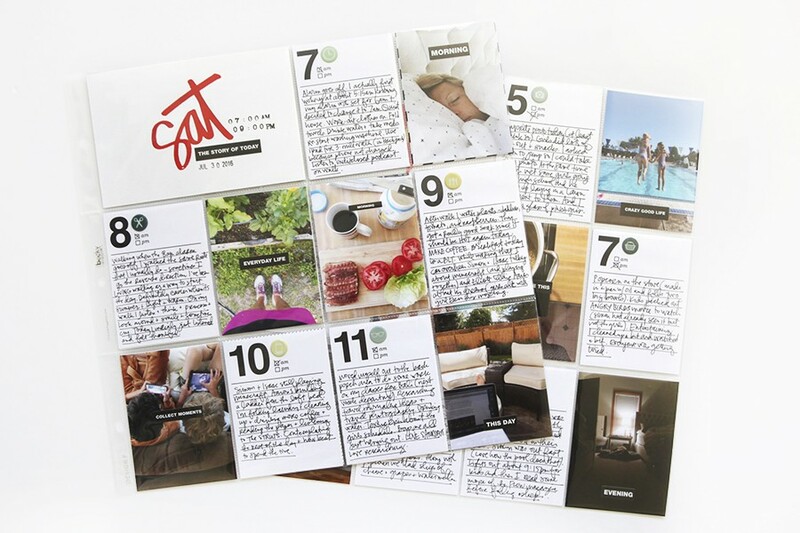 Gather up additional journaling I did on my blog and either create layouts or simply print out journaling pages similar to what I've done in Project Life using the Long Journalers. This shouldn't take too long as the posts about her are tagged as Anna (oh how I love that simple little organizational tool). 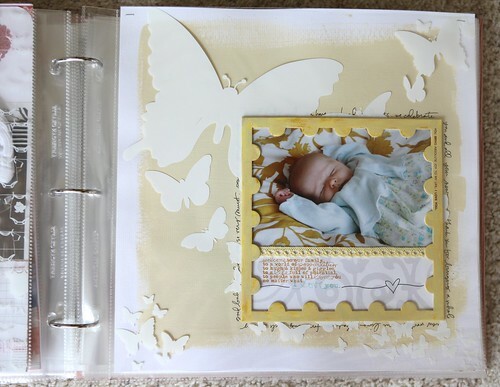 I also found, as I was looking through my Designer Digitals gallery and putting this post together, that I have quite a few other pages completed that belong in this album (both paper and digital). 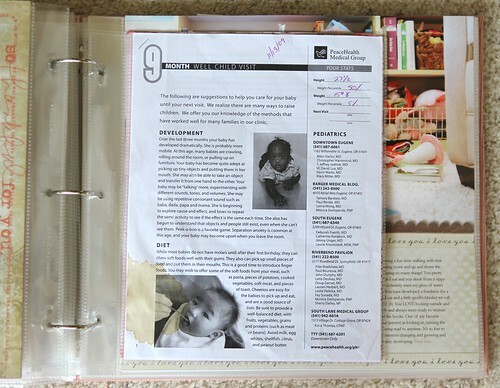 I need to see if I printed the digital pages already (which I think I did) and either get them printed or move them from the 2009 or 2010 family albums. Pages like this one, this one, this one, this one, and this one. 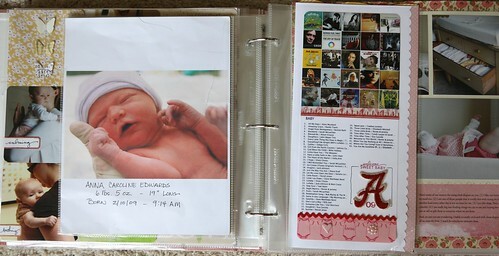 Ali Edwards | Anna Baby Book Walk-Through from Ali Edwards on Vimeo. Here's a look at the inside of this album via the lens of my camera with links to more information about specific layouts when available. 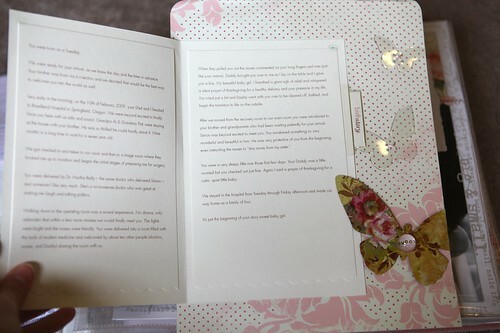 A divided page protector opens the album and includes the notice of her birth from the local paper, our bracelets, the hospital photos, her newborn hat, etc. BIRTH STORY. 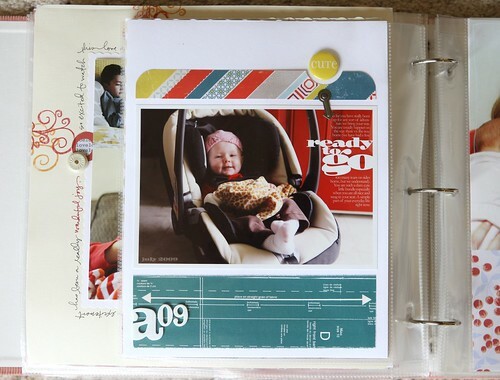 A few of these pages were featured in my Studio A column in Creating Keepsakes magazine in November 2009 (and other Studio A columns throughout the second half of 2009). The theme of the article was using your own past pages as inspiration for new pages. I used a bunch of page designs I had created that told stories about Simon's first few months as jumping off points for these pages about Anna. 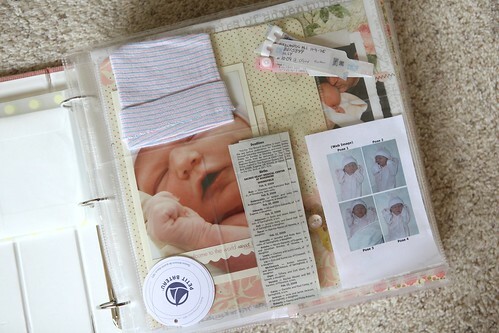 The photo opens up to reveal her birth story. DAD AND DAUGHTER. 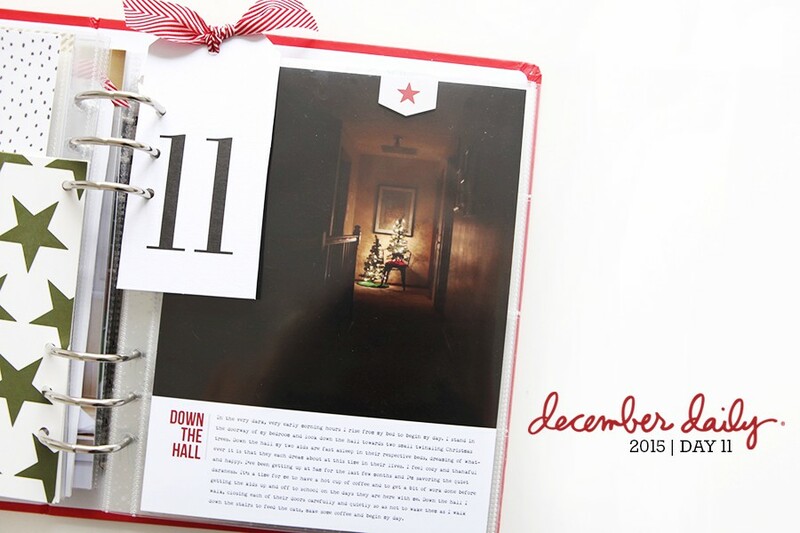 Details about this digital layout can be found here. 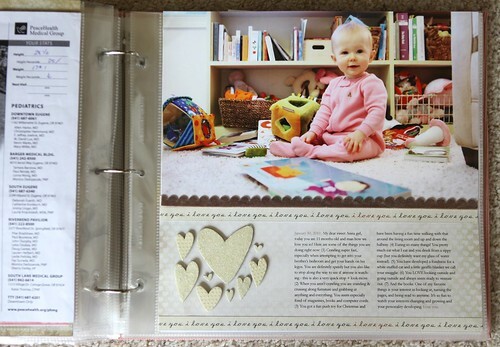 First featured in Creating Keepsakes Studio A column July 2009. FIRST SEVEN DAYS | THE JOURNEY BEGINS. I love this one. One of my favorites. YOU = LOVE. Details about this layout can be found here. Words came from a blog post here. HOSPITAL PAPERS. There's a bunch of these sprinkled throughout the book. WAITING FOR BABY. This one will be moved forward in the album. DOCUMENTING THE TUNES. Details on the layout can be found here. The opposite image was the photo my Mom printed out for Simon to take to school to share the story of his new baby sister. Story blogged here. 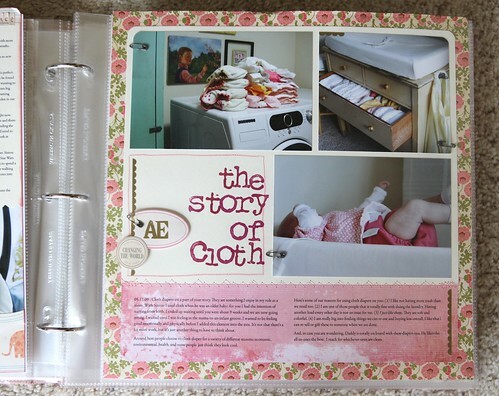 THE STORY OF CLOTH. Content taken from this blog post. GENERATIONS. 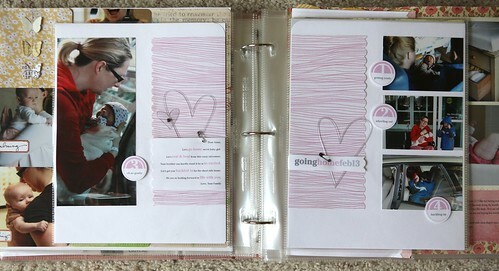 One of my favorite kind of layouts that shows photos from now and then. A photo of me and a photo of her and then one of us. I shared the Me & Her image on my blog here. THE ONESIE. The binder clip is working just right at keeping it in place. SWEET BABY. Details on this layout can be found here. AND THE GREATEST OF THESE. From a Studio A column in 2009. HELLO YOU. Photos of Grandparents first meeting Anna and Simon being so excited to have a sister. REMEMBER THIS. More details on this layout available here. PLANNING. DREAMING. Another page about getting ready for her arrival. ANNA AT 11 MONTHS. Details on this layout can be found here. THANKING GOD. More details on this layout available here. At the back of the album right now I've got some additional notes and things I'd like to include either on layouts or simply just included in the album inside a page protector. Wow. This has been quite a little journey for me and I'm feeling really thankful for the question that spurred me to take a closer look at this album. I also really have to emphasize how thankful I feel tonight that I've captured so many stories on my blog in the moment. Those are the stories I love so much - the ones that talk about what she's doing, what I love about her at a certain stage, etc. Those are the kind of memories that are just that much more difficult to recollect as times passes. This post is part of a 2011 Memory Keeping Q&A series. Additional posts in this series will be listed below as they are posted. Past Q&A posts are available via the Category Archives here. Wow Ali, i LOVE it! Thanks so much for answering so very detailed to my question! 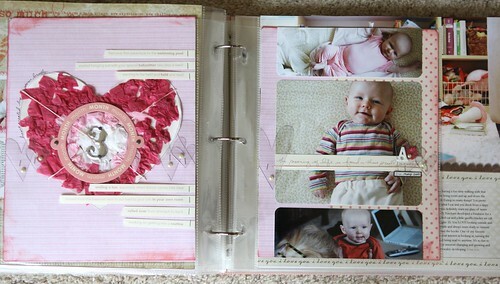 I´m still working on my daughters first-year-album and i´m soooo very inspired now! Thank you so, so much! oh my gosh!!!! i love this album! so beautiful. my fav or yours so far! Awesome post Ali. Thanks for sharing. Ali. It is so beautiful, so special and so artistic. What a document of love. I love your creativity....there is such a lightness about it, a sense of femininity and a telescopic look at such a wonderful moment. THANK YOU for sharing. oh ali, this is beautiful. thanks so much for sharing this! Beautiful! One lucky little girl (and I am sure, one luckly little boy also!) Thanks so much for this inspiration! I will be having my first grandchild (a boy) next month (OH MY GOSH) Just next month! 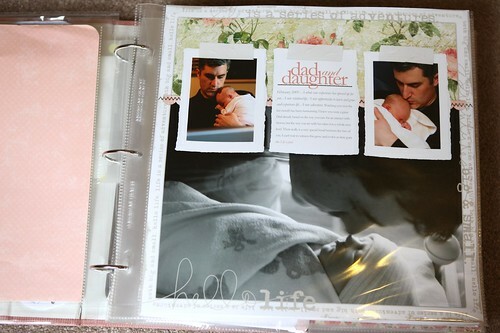 He will have a baby book similar to this. Thanks so much for the ideas. Maybe I need to start a blog! This this is awesome! 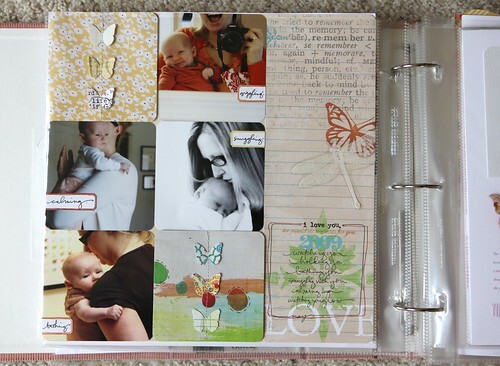 Gave me some new ideas on what else to put in my son's album. 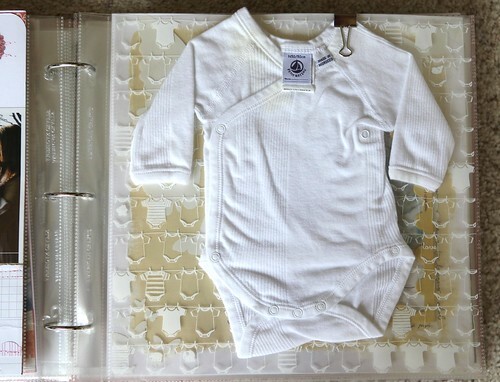 I have a onesie from my son's birth as well, I like the idea with the clip. Thank you for sharing, it means alot! I've learned a lot from you over the years and I have learned to let it be, even if it isn't perfect. Thank you, I read you everyday and you are ver inspiring! Thanks for answering my question. OH WOW! This is beautiful! 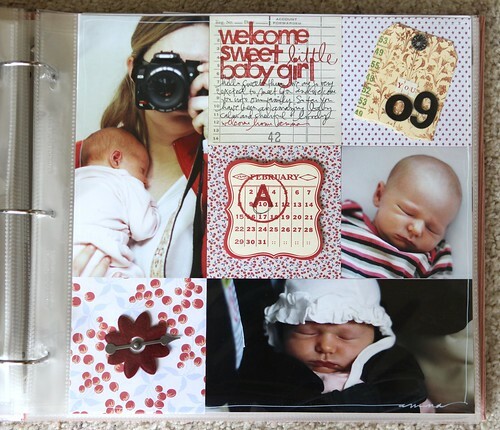 I really wish I had kept up with my baby journaling- the days went by and now I don't really remember much except that we had (and keep having) a lot of fun together. This is very inspirational- thank you. Beautiful book! I love the addition of the onesie! 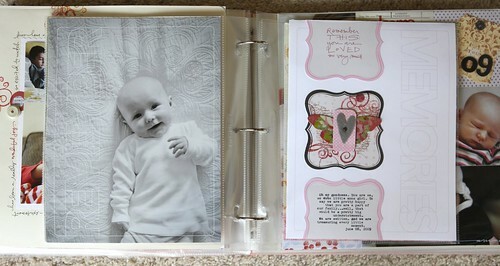 It makes me a little sad that I didn't scrapbook when my girls were young (they are now 18 and 21). And I love the picture of Anna at 11 mths wearing the one piece pink blanket sleeper. She looks just like her Mama! My girls wore those and I loved cuddling them when they wore them. Great memories! Okay, I'll just say I love you! LOL. At first I was a little sad that I didn't have this freedom when my babies were babies and I was feverishly working on their first years albums to do them perfectly. I giggled out loud when you, at the beginning of your video, just said flatly, "Really, I just don't care." I know what you mean, but that you do care so much about what matters. After that twinge of sadness, I got excited. 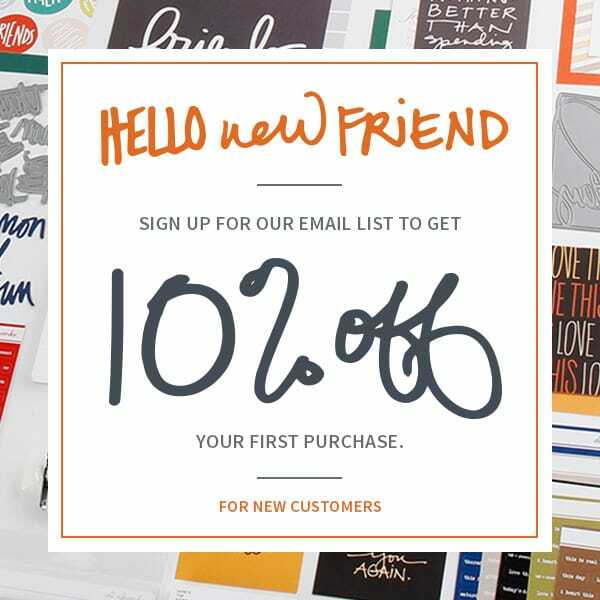 You and Becky Higgins (with Project Life) have liberated me to just tell my stories. Use my pictures that I love - for no other reason that I love them. Make them huge or make them baseball card size and slip them in. To take pictures not just to document, but to capture an emotion and convey that emotion to someone else. Thank you for sharing so much of yourself and your life to inspire someone else to let go and just do it! What a lovely baby book! A wonderful gift for Anna. Thanks for sharing and for going through it on video. Definitely a different experience to see it flipped through and to hear your thoughts. Awesome! 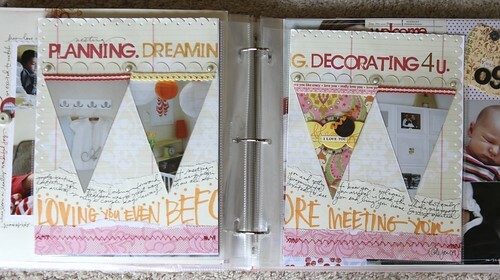 I just love all of the embellishments you use! seriously the most beautiful baby album ever. What a wonderful book Ali! So lovely Ali! What a great gift for your beautiful girlie! 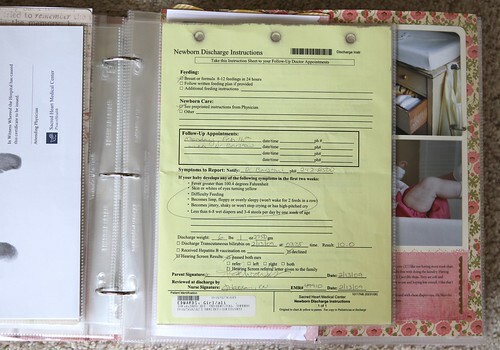 You know what I think will be cool about having the paperwork from the well-visits is not so much the stats about Anna, which are always nice, but think about her as a new mom looking at how we cared for babies in her childhood and imagine how different things might be! There might be some fun little tidbits in there even though everything seems perfectly reasonable in the today's light. I watch Mad Men and I think about how they all drink and smoke and generally do a lot of stuff that we would NEVER do in this day and age. I'm sure there will be some tidbit like that for her! 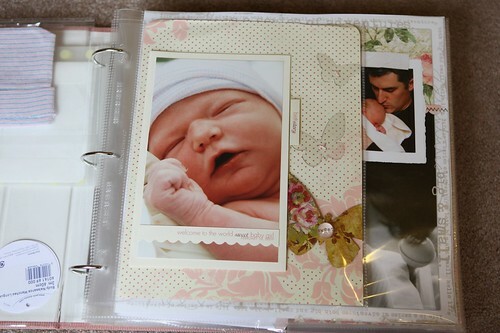 Really love that you took the time to page through Anna's baby album on video for us! 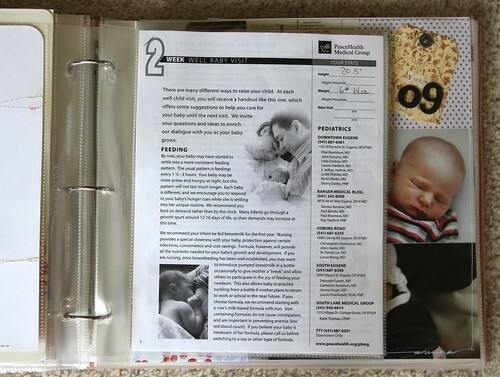 My baby is 8 months old now and I'm adding pages to his as I go. So helpful and such a beautiful album. Thanks! Ali, this is so beautiful and sweet. I loved seeing her as a baby again and can't believe she's 2 already. How fast they grow. She will love looking at this when she's older and be so happy you did this for her. Thanks for sharing. It's really more about the words...focus on the words and the images. What do you want to say to him? What do you want him to know about who he is right now and how you feel about him...don't worry about all the other stuff. Get to the heart of it. Oh I love this album! I took much the same approach for scrapping Kieran's stories, but now I have ideas for even more things I can add. 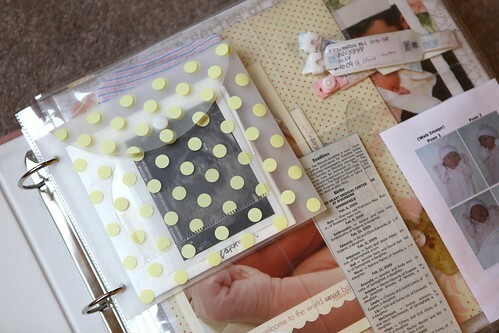 Like the tiny onesie, and the hospital papers. Thanks so much for sharing, I am officially inspired! Thank you for sharing! That is so beautiful! My baby is 10 months, and I've been working on her album as I go. 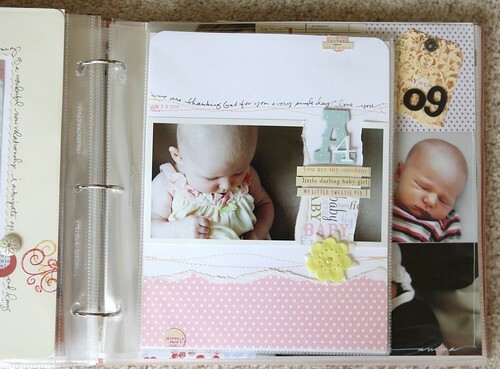 I've decided now that in future I think I'll use 3-ring albums instead of post-bound, but I'll finish out her post-bound first album. I've not been keeping too much memoribilia. It's not really my style. But I've got the photos and the stories. Maybe I'll put her well-baby pamphlet that the dr. writes in each visit, into this when it's all done. 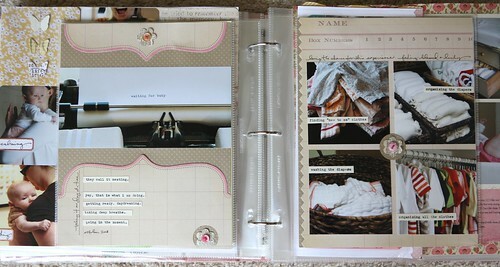 Now I have lots more ideas for pages in her book!